I happened to get lucky when I took a look. https://goo.gl/maps/YGDgydgxbwu (Google Street View) On the pole to the right there are three lines at the top and a neutral at the pole's midpoint, the usual arrangement. To the right there are 4 lines on top. The neutral rises from midpoint to the top over the span. I have seen this before on older setups, including up the road from me. Hello, and aha! I missed that one! Thanks for taking the time. I have seen in a number of instances in other locales utility poles with two cross arms. The upper cross arm has 4 wires and the lower one has 2 wires. In this case I think it's two sets of 3-phase MV distributions. I have also seen (mostly in dry desert regions of the U.S.) utility poles with one cross arm hosting 3 wires and the obvious lack of a neutral. 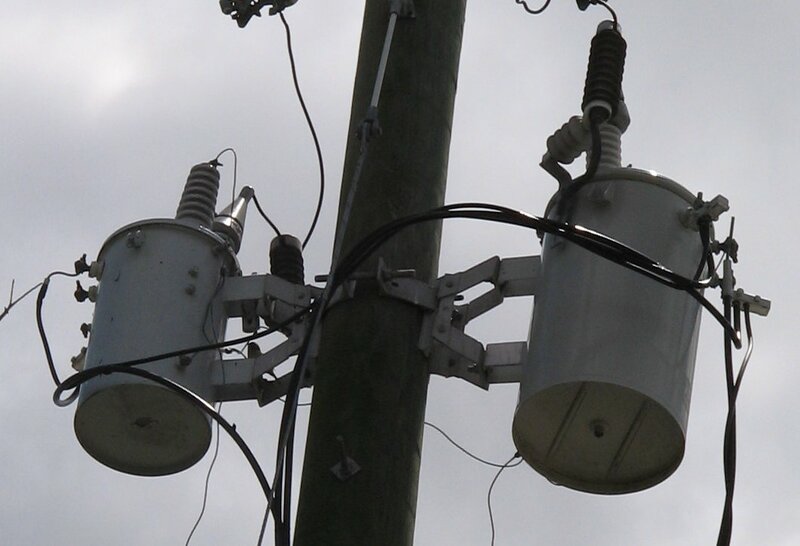 These runs usually cover many miles between loads with the primaries of MV-LV distribution transformers at the load locations connected line-to-line rather than the usual line-to-neutral. If for some reason a neutral is required at some location(s), grounding transformers can be employed. These areas are wide-open and dry most of the time. MV line faults to ground are probably rare. Thanks again for taking the time. I believe that is correct, two circuits. Especially when often one circuit heads off in one direction and the other in another direction. In the northeast US, many older rural areas have the MV distribution voltage wired as delta, transformer primaries connected line-line. Often these use a lower MV voltage, such as 4800V line-line. Often the electrical company will upgrade the lines in stages. The portion closest to the substation is upgraded first, almost always Y connected with a neutral. At the end of the upgraded section there is a transformer bank, connected Y-delta if the older section is delta. I've noticed one section upgraded 3 times over a decade. The first Y-Delta transformer bank was just south of an intersection, later it was just north of the intersection (because they upgraded the lines on the crossing road fed at the intersection) and now a smaller bank is several miles north. A quick look at the last transformer bank I mentioned looks like it may be connected delta-delta, not Y-delta as I said. I will have to take a closer look. Downstream of it is definitely connected delta, I am quite sure upstream is connected Y with neutral. How many transformers in that group? 2 or 3? Sometimes they can use 2 when wired delta (open delta) with a derating. If you know an approximate address, Google Street View may show it. On Wed, 3 Apr 2019 10:05:58 -0400, "J.B. Wood"
Looks like a boost transformer setup to me. Note the isolating insulators on each side of them and windings going to each side of the isolation. That is wye distribution IMHO based on the transformer connection down the street that is feeding the triplex. Going the other way there looks to be a 3p 208 wye that is abandoned for some reason by that parking lot. I never saw much 3p delta vee (red leg) up there when I was in the computer biz. Everything was 208 wye. It does seem pretty popular in SW Florida. The transformers look like this. That will be 2 transformers, one larger than the other. The big one feeds 120/240 loads and the smaller provides the 3d leg of a 240v delta. You see it in light industrial bays, usually, where they have a small 3p load and larger 120/240 loads. I agree it is a wye connected MV-MV stepdown configuration, despite having 3 bushings/can rather than two + neutral. It appears to be fed from the commercial area in the direction away from the residential area. It is fed from the top of a 2 circuit setup, the top circuit has different/larger insulators so it probably is at a higher voltage than the bottom one. I have seen similar configurations for converting 13.8kV to lower, wye to wye. Some appear to have a metering current transformer on the neutral legs, going to meters on the pole. BTW across the road from the abandoned setup there appears to be a red leg delta configuration on a pole. Two transformers of different sizes fed from 2 of the 3 MV phases. Here are a pair of open delta connected regulators. https://goo.gl/maps/78toCv1rfF52 I believe they operate at 4800V line-line. Next pole(s) up the road have a wye-delta transformer bank supplying them. I mentioned them since your earlier reply indicated that you thought delta connected regulators didn't exist or you didn't know of any. Perhaps I have misinterpreted your reply. Just up the road they upgraded a short stretch from 2400 Y to (I think) 7970/13800, to allow for a solar farm. Both before and after there was a transformer bank and a set of regulators a few poles downstream. Delta as opposed to Wye? Circuit tester reading w house neutral disconnected? 12 Amps on Water Main! Why is the neutral isolated in a sub box. Releasign Threadlocker w/o Wrecking Heat Treat?